Unclean water was a mile AWAY. Now clean water is just a few steps. Make a difference for GENERATIONS. See how hundreds can be helped with each well. We believe that one of the greatest differences we can make in Africa is in providing sustainable access to clean water to rural communities in need. As you read the real life success stories below, you will understand why and how we undertake our Village Water Projects, and you will also discover how you can help to save and improve lives through the gift of clean water. Since 2009 our team has completed 32 successful Village Water Projects, which have served more than 5,700 people. Because there is a lack of clean water in many rural villages in Africa, diseases transmitted through unclean water are a leading cause of preventable illness and premature deaths, with children being particularly vulnerable. According to the World Health Organization, nearly a million people die each year as a result of unsafe drinking water, with about half of those being children, whose deaths are preventable (fs 330/391). In addition, during the dry season, hundreds of collective hours can be spent each week in transporting this unclean water, by hand, from surface water sources such as rivers and swamps to the villages; this same time could be spent doing more productive activities, such as attending school or growing crops. The partnership effort to install a well in each village immediately improves the health and well-being of everyone in the village, even saving lives. In addition to health benefits and resulting increased productivity, the local water source allows for a reallocation of time toward more productive activities, as well as allowing for cultivation of vegetable crops throughout the year through irrigation. It can also provide a source of revenue that will be used to increase the quality of life in the village, including education, medical care, and access to technology. MORE THAN WATER? : Yes, clean water makes an extraordinary difference from the moment the first bucket of water is pumped. But as we have worked in partnership with the communities it has become very evident to us that it isn’t just about water. It is about participatory community development, empowerment, and sustainability, all based on sharing concepts of self reliance, economic cooperation, and proactive improvement for the common good of all members within the village. That’s why our Community Development System is so vital to the success of a Village Water Project. Before we take any steps to dig or drill a well, the community must first take steps toward organizing their Water and Sanitation Committee, and they must appoint a treasurer and secretary who will oversee the collection of a Well Fund, which is kept in the community exclusively for the purpose of maintaining the water system after we have installed it. Four men and four women are appointed to be trained on the complete disassembly, reassembly, and repair of the AfriDev hand pump, so when a breakdown occurs, there is found within the community the knowledge, ability, and money to immediately undertake the repair. Not only does this ensure that the well will be able to sustain the water needs of the community over time, it is a springboard to other development within the community, based on economic cooperation and functioning service committees. Needs assessment and documentation, hygiene and sanitation training, hydro-geological surveying, drilling or digging, hand pump installation, community development training, and follow up. 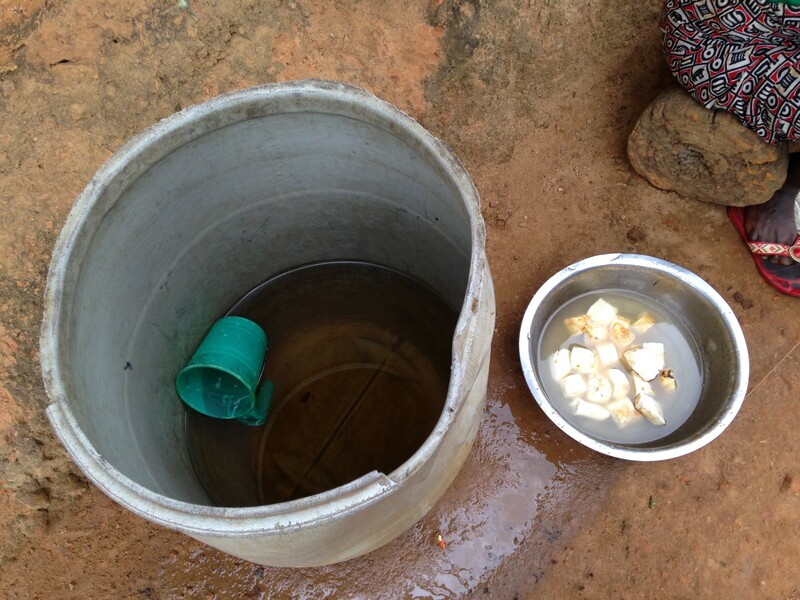 WHAT IS A CLEAN WATER WELL? Clean ground water can be obtained in villages with a hand-dug well or with a bore hole well. Hand dug wells are 3-4′ wide holes in the ground that have been dug with tools to a maximum depth of 40′, then finished off by lining with concrete culverts and covering with a pad and hand pump. When the water table is too deep to reach by hand digging, a bore hole is required to access clean water. Bore holes are drilled deep into the ground (15 to 85+ meters) using a drilling machine, which can be hand powered (like our Village Drill), or motorized with hydraulic power. Drilling takes place in the location where the community and the drill team feels is most likely to contain underground water. After drilling the well is equipped with 4″ PVC pipes and lined with pea gravel, and then developed. In development the bore hole is cleaned of all cuttings and the water is flushed until it becomes clean. The well is then finished with a concrete pad installed over the hole, and a hand pump installed to allow clean water to be brought to the surface. Africa Heartwood Project has experience with bore holes and hand dug wells in Ghana and Liberia, and has a trusted team of contractors we have trained in our methods for hand digging and bore hole drilling with our Village Drill, on call in Liberia for when funds are ready for the next project. See some real-life examples of people who made the choice to get involved, what they did, and how they helped: The Wilcat Water Project is one example of how one teacher, school, and community united to provide clean water for Ogyanhyewano & Akromakwaa villages. The Angelic Connections Water Project shows how one drumming community provided clean water for Kofi Tabrikrom village by simply doing what they love to do – play drums! More recently the Good Bird Design and Queer Spirit mobilized their communities to raise funds for Fawomanye and Ankyease villages. Read more below.